It took Google Wave months to go through initial excitement, people trying to make sense of it and discouragement with half-baked product. Google Buzz managed to burn through same cycle in a week. So what exactly Google tried to pull with new Buzz service and why it is neck deep in negative feedback? Buzz is Gmail expansion that integrates it with multiply Google services, as well content from non-Google sites, to syndicate your content together and get content of your mail contacts syndicated to you. It uses follow/followed model (common in social services) and Google email+chat contacts as initial pool. Buzz has started on the back of massive Gmail userbase and got excellent jumpstart from that. Some people treated it as bad thing to boast about, but really – if you have such resource it completely makes sense to use it. Starting from scratch in this case would be just dumb. Some streams Buzz can integrate are common (Twitter, ahem), but it also can stream info from generic sites. 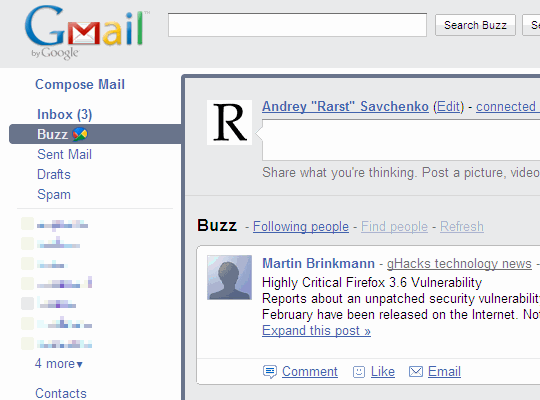 As far as I can tell it doesn’t even use RSS – I had some older posts show in Buzz after edits. I assume it makes use of sitemap or just raw data from Google bots. between @-style addressing and Gmail notifications it is very easy to follow conversations. sites, set up in profile, are used as possible sources in Buzz. after all these years people still have no grasp that what they make public online is PUBLIC. Google tried to throw a lot of people into social experience, and most of them were not conditioned by previous usage of social experience. It backfired. farther from Gmail and it would be standalone service, hub to bring other Google services together. Instead they hit being thing that is too raw to be solidly valuable and too weird for immediate mainstream appreciation. Aside from panicked rounds of idiot-proofing privacy issues, it seems that Buzz might take second route and move farther from Gmail into distinct separate service. Will see how it goes. As for my personal gripes – Buzz broadcasts stuff I already read elsewhere and forces itself on other services like Gmail and Google Reader in rather inconvenient ways. The things that allowed it to take that jumpstart also highlight that there is not much interesting about Buzz itself for now. Buzz seems like Google’s experiment into new type of release cycle. Instead of squeezing product through limited number of techies it tried to leverage large mainstream userbase. if Buzz will get sufficient development to mature into solid product. All interesting things to know, but I suspect Google is not likely to openly discuss. Do you use Buzz? What is your take on it? Can’t you see Google is trying outdo Twitter and Facebook with their Wave and Buzz,but with privacy their biggest disregard,I say Thanks but no thanks.What about Yahoo’s MEME? Buzz seems slightly like Twitter but content is backwards. Twitter is to post and syndicating is secondary (at least supposed to be). Buzz syndicates first and people post little (if at all). As for privacy – I don’t see Buzz doing anything particularly evil. It was bit too eager to use contacts data, but it had informed about that from the start and changed behavior in few days to suggest only. I see that you have blurred out your labels in Gmail . :) I take it that if the contacts list was visible you would have blurred it as well. Whats the point if suddenly one day Google decides that your contacts page should be visible to the whole world via your profile page? They did rectify this but it should have been optional right from the start. I didn’t blur labels because I consider those highly private. :) They are just boring stuff like “comments” and “posts”. However this stuff is part of details Google asks for if there is need to verify account ownership. Not wise of a thing to show whole Internet. I don’t remembering Google showing my contacts page to anyone. I do remember Google using small set of my most active contacts and explicitly telling me they are displayed on my profile page, as well as providing visible options to disable that. As I wrote – Google was too eager to use that info, sure. But total overreaction by people just shows a gap in their email usage and their real feelings towards their contacts. :) I cynically find it hilarious. Some people(e.g company professionals) could have had sensitive contacts and many people keep the same email id for work and for personal purposes. If you’re trying to convince me that I’m overreacting and I’m hypocritical then perhaps you’re right. :) But if you’re trying to convince me that Google did not have a privacy issue, I won’t agree with you. Sorry if it sounded aimed at you, I meant that some people really freaked out and were screaming first and looking at settings second (or never). Peak of stupidity was complaining about Buzz showing publicly (!) shared Google Reader items. This most certainly was a privacy issue. Google did screw up a bit. But many treated situation like Google has an huge obligation to babysit their privacy and think for them. I would when I have more time. Till then I have a tumblog, saurabhk.tumblr.com. Its fate is yet undecided. :) (Warning: NO original content whatsoever) I am hoping that I get more time when I get into college. Sorry for spamming your post but: here’s an update on some privacy issues. of Internet users feel the same way. Waaay too esoteric ! My problem is Buzz is no what it delivers, it is that it delivers things I read elsewhere anyway.